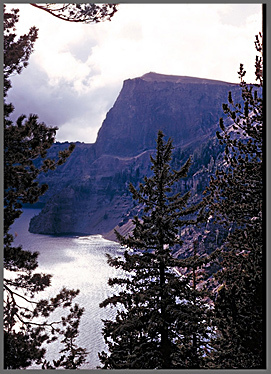 I searched for an impressive name for this short story, but finally settled on a more truthful title: "Young and Dumb at Crater Lake"
"I patrolled the shores west of Crater Lake's Cleetwood Cove for an hour, searching for a spot, any safe spot where one might dive into the Lake, but the 1,500 ft. high cliffs were so steep that I was near to giving up when I found my diving spot. It met my requirements: an accessible platform only a couple feet above the Lake, and with the requisite near-vertical drop-off into deep water to aim myself at. I didn't want any chance of hitting underwater rocks, and that's all there is along Crater's plunging shore-- rocks, not soft mud, no weeds, no sand, nothing but that phenomenal water, crystal pure, like looking through glass all the way down to maybe 50 feet deep, but then the eerie shadings of ever-deeper blue swiftly increasing as one's eye sweeps away from the shore... I tossed a very large flattened, light color rock as far out as I could get it from a perch 10 feet above the lake. It hit with a normal big splash, and then I watched in a fascination turning to horror as it fell into the depths, rocking and swaying, seeming to flash as its whiteness would catch the light, but rapidly shrinking until, just before it winked out, it hit the side of the steep underwater cliff, bouncing downward as a dot, then gone forever. 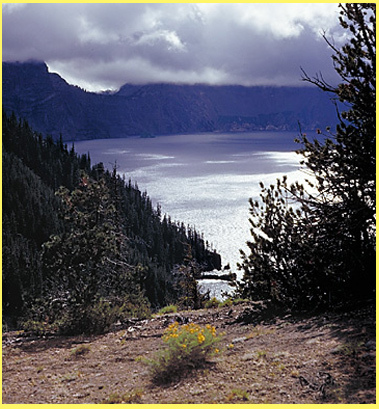 The Rangers say you can see to nearly 300 feet deep in Crater's water (*see note), and I remembered the map of the Lake bottom, realizing that it was only a half mile away to the Lake's deepest point, a stygian 1,932 feet. 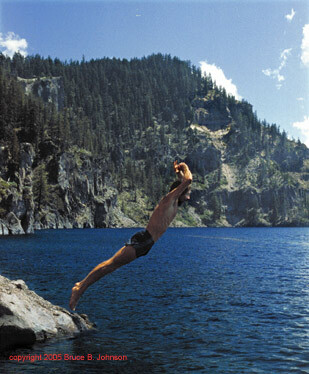 There I was, a college boy, poised to dive in like that rock. How cold is that water? My skin registered a hot sun, that hot high altitude sun that belies that the air is probably not even 70 degrees. I recalled reading that the Lake waters seldom freeze in the winter, but never warm above about 38 degrees in the summer. I tried to form my body into the perfect diving pose, breathed a huge breath and launched myself. Hitting the water, I was pleasantly surprised for a second, the water felt far warmer than 38 degrees, but then I was beneath the thermocline and the cold hit me like a body wrap of ice cubes, and I was pointed straight down into the bottomless! Not quickly enough, my momentum killed, and I kicked ferociously upward, away from the deep blue void below. My skin welcomed the seeming warmth of the upper layer of the water, and I worked to float high enough in it so that my feet didn't sink back into the iciness below. The shore was close, but a panic thought crossed my mind-- Reality, that maybe the cliff was too steep, that I would be unable to scale it and regain the warm land before hypothermia sunk me like a stone. I kicked harder yet, and my fingers touched cold rock, and in a blur they rose up to grab warm rock. Then my feet banged rocks, and it hurt, but I ignored the hurt and thrust myself out of the unfriendly waters. My entire skin was taut and fiery with the cold that had gripped it. I rushed to my camera to check that its self-timer had snapped my dive. The hot sun gradually seemed to burn my pre-dive personality back to life, and I dressed, and clambered along the cliffs until I was able to step back onto the Cleetwood Trail, trying my best to inconspiculously mingle with the hot, dusty crowds who would never know my secret tasting of the waters." * the official method of measuring water clarity is the "Secchi" disk, and it is stated that if you could lower a Secchi disk into absolutely pure water, the theoretical maximum value would be between 70-80 meters (230-262 ft). 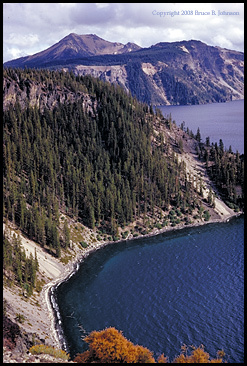 In real-life measurements, Crater Lake in 1972 was measured at 144 feet, while the clearest water ever actually measured was in the Weddell Sea, Antarctica in 1986 at 260 feet. Link to my story about a mountaintop spiritual awakening-- "Dawning"
Below is a wonderful piece by my long-term contributor, writer J.D. Adams of Salem, Oregon. rediscovered by gold miners in 1853.
long journey, mythical and yet real. Park Entrance, and the cross-country skiers will have it all to themselves. rippling patterns of sunlight in a looking-glass of blue.